Spring is finally here and it’s time for the traditional spring clean – to clean the winter dust out of the home, clear out the clutter and get ready for summer. But what can you do with all the clutter you clear out? 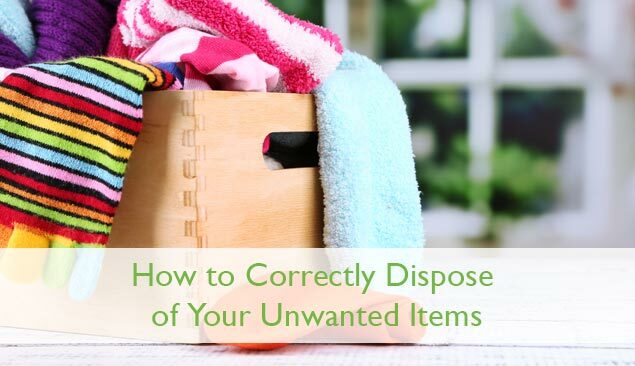 From ornaments to ovens, let’s look at five of the best ways to get your unwanted items out of your house for good. The first, and often easiest way, is to donate them to charity. Most local high streets have at least one charity shop and you simply have to bag up the items you want to donate and drop them off. If you have larger items such as furniture, a charity may be able to come and collect them from you – a simple internet search should give you details of who offers this service in your area. You’d be amazed at how much stuff you can get rid of simply by asking if anyone wants it. Put the word around that you have some items to give away and watch as your friends and family snap them up. A quick post on any social media networks you use can also pay dividends as people will ‘share’ your offer among their friends. If you are looking to make a bit of extra cash, then you can always try selling your unwanted items. Car boot sales are probably the easiest and best if you have a lot of items to dispose of. Alternatively, online selling sites such as eBay or Gumtree can be a great way of clearing out your unwanted things. Don’t forget the ‘low-tech’ options as well – a card in the window of your local corner shop or supermarket can often be just as effective as an online ad. If your items cannot be donated or sold, then why not find out if you can recycle them? Most areas have a local recycling centre where you can dispose of a huge variety of items including white goods, bikes, furniture and electrical items. Many recycling centres have arrangements with third parties who will take, for example, bikes and refurbish them and sell them on in the local community. Details of your local council recycling centre and what they will take can usually be found online. If you have tried all of the above and not had any success, then the final resort is to take your items to the local refuse centre where they will be sent to landfill. Whilst sending goods to landfill is not the best option, for certain items it may be the only option available to you. Details of your local refuse centre will be found online.